Several large food brands have been known to partner with other lifestyle brands or celebrities to become full-circle, to cement credibility, and to raise awareness to a larger audience. For example, Taco Bell has a partnership with the NBA, Subway has teamed up with Michelle Obama to spearhead childhood obesity, and Red Bull pairs up with so many different extreme sporting personalities/events, we stopped keeping track. But what about smaller restaurant and food brands that don’t have the budget for these kinds of sponsorships? Because, let’s face it, most don’t. Let’s reflect for a minute. Remember the days when celebrities were ‘untouchable?’ Before reality television became more invasive than informative (wait, did that ever happen)? Before you were one tweet away from connecting to virtually anyone? Celebrities have become humanized, thanks to the power of technology and social media. On top of that, user-generated platforms like YouTube have launched “normal” people (read: not celebrities) into rising stars. Now, think of this landscape of interconnectivity in terms of big brand versus small brand. With modern tools and resources, brands are able to reach more people just because they can. This is obviously why customer service has shifted to social media and other digital avenues. In this realm, success is measured based on the goals you’re trying to achieve, but for the sake of being general, most brands would agree that a successful message or brand campaign is measured by reach, shares, and — if you’re lucky enough — going viral. A perfect example? Big Mama’s & Papa’s pizza chain. 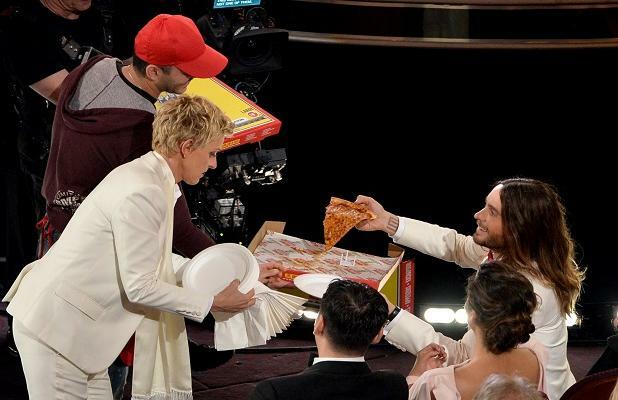 Unless you’re in Southern California, chances are you’ve probably never heard of them before — that is, until Ellen Degeneres decided to order a few pizzas from Big Mama’s & Papa’s while hosting the Academy Awards on Sunday night. She publicized the brand when she brought the pies, along with the delivery guy, up on stage, and proceeded to hand out pizza to A-list celebs sitting in the front rows. According to various news sources, sales at Big Mama’s & Papa’s increased up to 500 percent because of the unintentional plug. Small Brands x Big Personality x Sensationalism. While Big Mama’s & Papa’s probably didn’t foresee their instant 15 minutes of fame, other brands oftentimes try to seek out these opportunities. With the aforementioned rise of technology breeding more accessibility, reaching out to well-known personalities to raise brand awareness on a viral scale no longer seems unachievable. With Charlotte residents and Jimmy Fallon fans challenging Fallon to eat the World’s Hottest Burrito via Twitter, Facebook, and videos, reachability and shareability will likely be achieved, but only time will tell. With so much hype surrounding his new spot on late night television, Fallon is a perfect contender for a viral campaign proposition. And the focal point of the “World’s Hottest Burrito” plays into the sensationalism that people love, as well as brand awareness, and an underlying competitive nature that’d be difficult to turn down. The burrito is made up of Smokin’ Ed’s Carolina Reaper (dubbed The Guinness World Record’s hottest chile pepper). Moreover, the #WorldsHottestBurrito campaign supports Dove’s Nest, a local women’s program in Charlotte. Even if Fallon doesn’t pull through (we hear he’s busy sometimes), the campaign still hits on all the necessary bases, making it a win-win no matter the outcome.